The Clemson Tigers Schutt XP Full Size Replica Helmet Schutt�Replica has a high gloss appearance, official team decals, colors, and actual Schutt logos.� Schutt created this amazing full size replica helmet for the college super fan on the brand new Schutt Air XP shell. Its an affordable way to collect your favorite team and is great for autographs. The "large" full size shell is made of molded Kra-Lite II Polycarbonate Lexan, painted team colors and clear coated with a shiny protective finish. Schutt installs a non-functional padding set and a 4-pt high hookup chinstrap. Its fitted with a steel polyvinyl-coated facemask and official teams decals and striping (if any). Helmet does not offer head protection and is not made for competitive play. Plastic insert installed inside helmet to discourage wear. The Schutt XP Replica Helmet measures approximately 13" (L), 9" (W), 10" (H) - great for displaying on your shelf. Replica helmets make great gifts and are perfect for autographing. 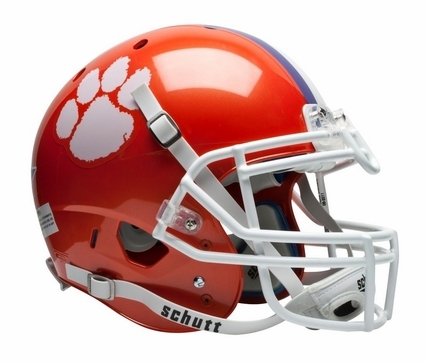 Order your Clemson Tigers Schutt XP Full Size Replica Helmet today!